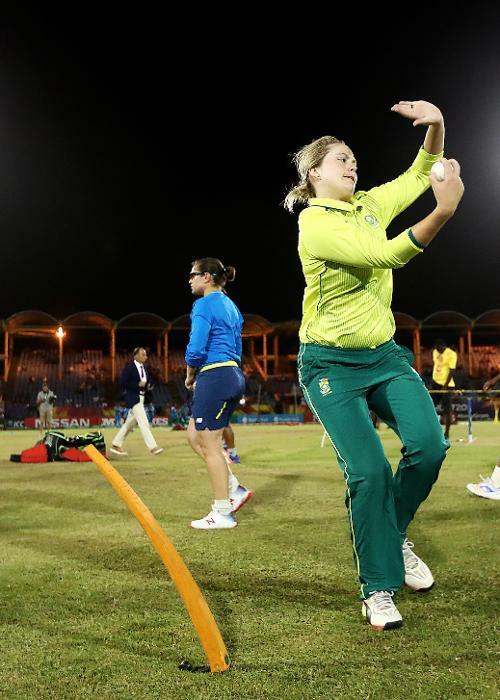 Dane van Niekerk of South Africa warms up ahead of during the ICC Women's World T20 2018 match between Windies and South Africa at Darren Sammy Cricket Ground on November 14, 2018 in Gros Islet, Saint Lucia. 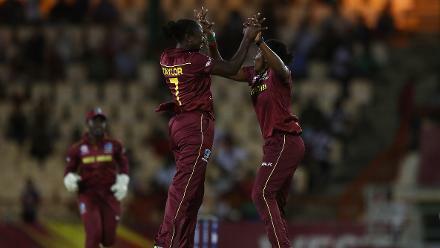 Windies warm up during the ICC Women's World T20 2018 match between Windies and South Africa at Darren Sammy Cricket Ground on November 14, 2018 in Gros Islet, Saint Lucia. 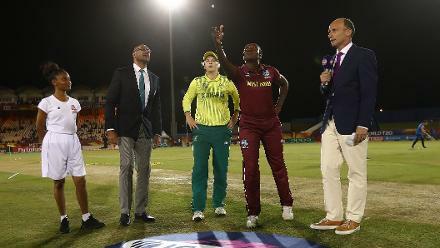 Dane van Niekerk of South Africa and Stafanie Taylor of Windies pictured during the coin toss during the ICC Women's World T20 2018 match between Windies and South Africa at Darren Sammy Cricket Ground on November 14, 2018. 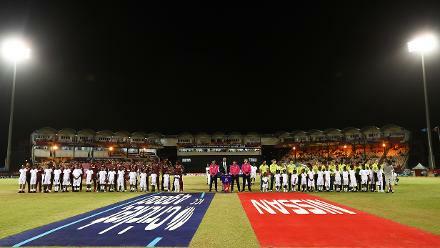 Windies line up against South Africa during the ICC Women's World T20 2018 match between Windies and South Africa at Darren Sammy Cricket Ground on November 14, 2018 in Gros Islet, Saint Lucia. 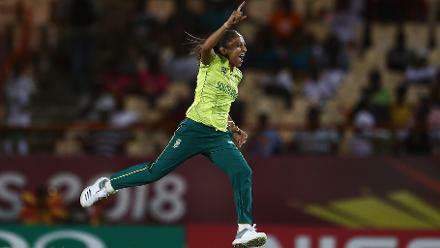 Shabnim Ismail of South Africa celebrates the wicket of Stafanie Taylor of Windies during the ICC Women's World T20 2018 match between Windies and South Africa at Darren Sammy Cricket Ground on November 14, 2018 in Gros Islet, Saint Lucia. 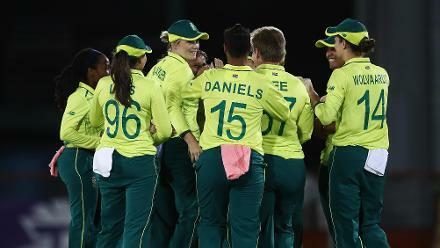 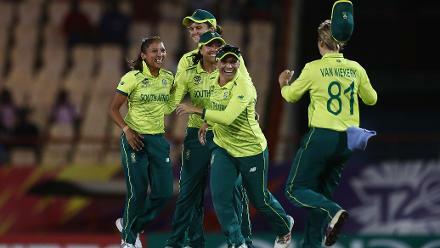 Dane van Niekerk of South Africa is congratulated on catching Hayley Matthews of Windies during the ICC Women's World T20 2018 match between Windies and South Africa at Darren Sammy Cricket Ground on November 14, 2018 in Gros Islet, Saint Lucia. 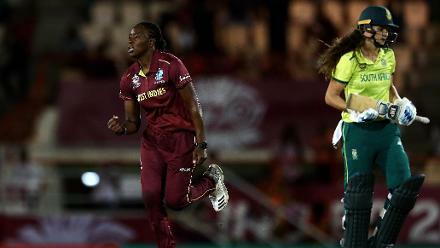 Shabnim Ismail of South Africa is congratulated on the wicket of Stafanie Taylor of Windies during the ICC Women's World T20 2018 match between Windies and South Africa at Darren Sammy Cricket Ground on November 14, 2018 in Gros Islet, Saint Lucia. 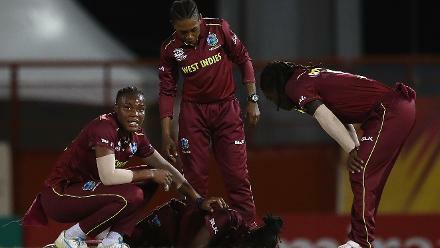 West Indies players look on, after Stafanie Taylor of West Indies hurts her shoulder during the ICC Women's World T20 2018 match between West Indies and South Africa at Darren Sammy Cricket Ground on November 14, 2018 in Gros Islet, Saint Lucia. 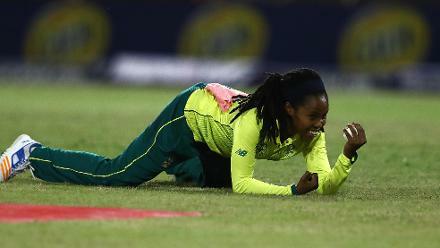 Tumi Sekhukhune of South Africa celebrates catching Natasha McLean of West Indies during the ICC Women's World T20 2018 match between West Indies and South Africa at Darren Sammy Cricket Ground on November 14, 2018 in Gros Islet, Saint Lucia. 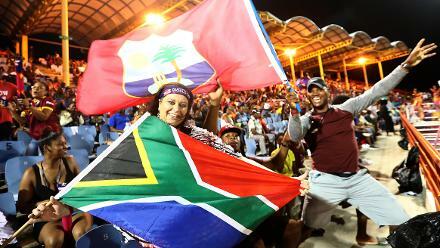 South Africa and Windies fans show their support during the ICC Women's World T20 2018 match between Windies and South Africa at Darren Sammy Cricket Ground on November 14, 2018 in Gros Islet, Saint Lucia. 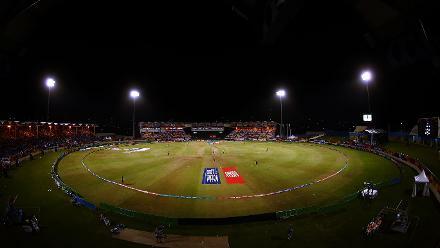 A general view of the Daren Sammy Cricket ground during the ICC Women's World T20 2018 match between Windies and South Africa at Darren Sammy Cricket Ground on November 14, 2018 in Gros Islet, Saint Lucia. 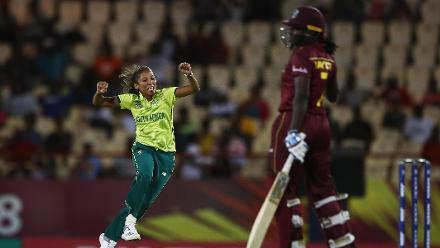 Shakera Selman of Windies celebrates the wicket of Laura Wolvaardt of South Africa, after she was caught by Chinelle Henry of Windies during the ICC Women's World T20 2018 match between West Indies and South Africa, November 14, 2018. 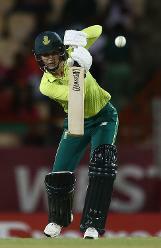 Marizanne Kapp of South Africa drives the ball towards the boundary during the ICC Women's World T20 2018 match between West Indies and South Africa at Darren Sammy Cricket Ground on November 14, 2018 in Gros Islet, Saint Lucia. 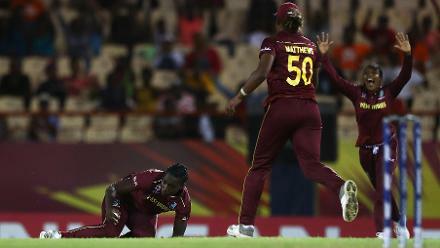 Stafanie Taylor of West Indies congratulates Shakera Selman of West Indies on the wicket of Laura Wolvaardt of South Africa during the ICC Women's World T20 2018 match between West Indies and South Africa, November 14, 2018. 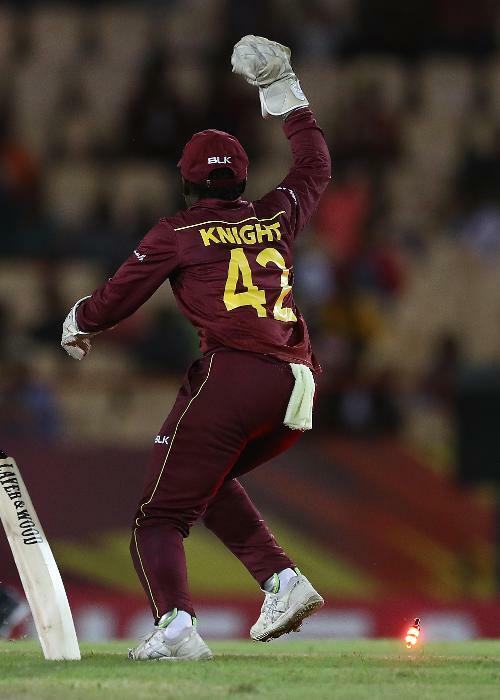 Kycia Knight of West Indies celebrates the run out of Dane van Niekerk of South Africa during the ICC Women's World T20 2018 match between West Indies and South Africa at Darren Sammy Cricket Ground on November 14, 2018 in Gros Islet, Saint Lucia. 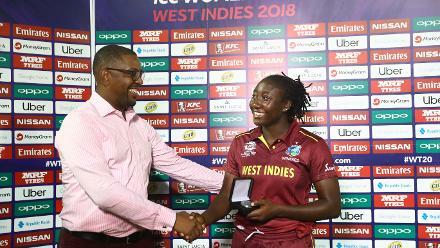 Stafanie Taylor of Windies is presented with the 'Player of the Match' award from Whycliffe Dave Cameron, CWI President after the ICC Women's World T20 2018 match between Windies and South Africa, November 14, 2018. 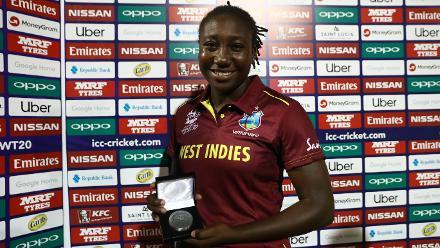 Stafanie Taylor of Windies with the 'Player of the Match' award after the ICC Women's World T20 2018 match between Windies and South Africa at Darren Sammy Cricket Ground on November 14, 2018 in Gros Islet, Saint Lucia. 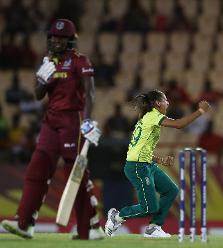 Shemaine Campbelle of Windies catches Sune Luus of South Africa during the ICC Women's World T20 2018 match between Windies and South Africa at Darren Sammy Cricket Ground on November 14, 2018 in Gros Islet, Saint Lucia. 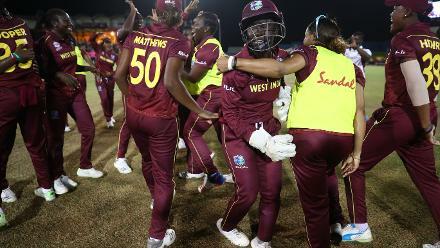 Windies celebrate their win over South Africa during the ICC Women's World T20 2018 match between Windies and South Africa at Darren Sammy Cricket Ground on November 14, 2018 in Gros Islet, Saint Lucia.